Kansas City Man Gets Six Pack Abs at 44 with Hitch Fit! 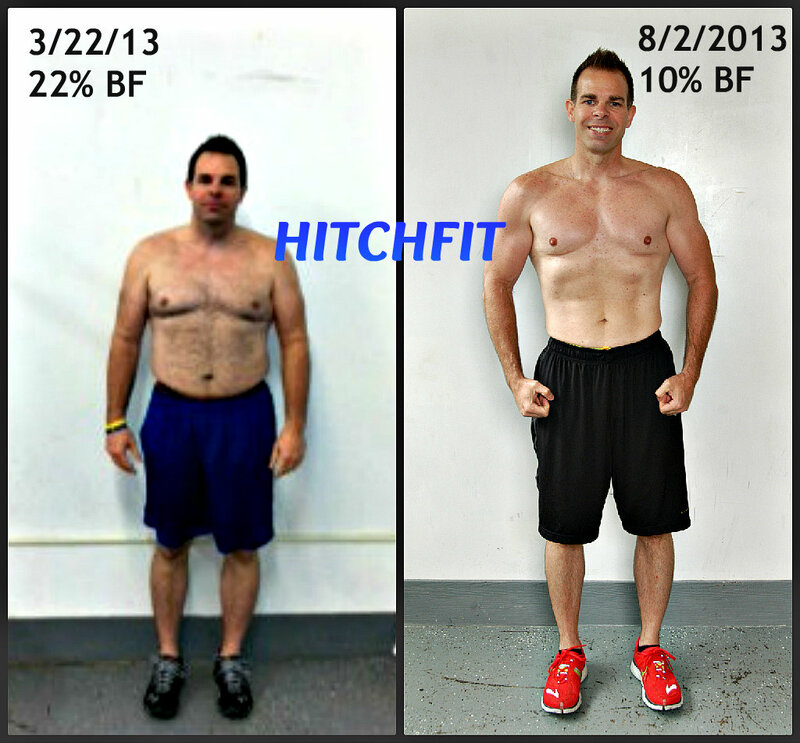 Home/Success Stories/Kansas City Man Gets Six Pack Abs at 44 with Hitch Fit! Overland Park, KS at 91st & Metcalf next to Whole Foods Market. To work with one of the Hitch Fit TRANSFORMATION Personal Trainers at either location call 816-753-8900 or write to [email protected] for details on rates and how our programs work. I always considered myself to be athletic, staying active with sports and of course my children. I was a frequent to infrequent visitor to the gym; and when I was there, I felt that I had a decent grasp on what I was trying to achieve. When I would step into one of my ‘active’ phases, I would try to make changes to my diet. In my mind, I know I was not going extreme, but felt it was enough of a change to make an impact. But, no real transformations were taking place, and let’s face it, traveling daily for my job brings me all so close to an array of fast food places, as well as my biggest vice, Coke! I had been following HitchFit for a few months through some great friends who actually took the stage in May, Heather and Frank. My wife, Sarah, and I learned a lot about the program and saw the transformations they were going through. That was really when I started questioning if this was something I should do. I know that I have physically been through a lot over the years, battling and conquering cancer and rotator cuff surgery only 20 months prior. Getting ready to turn 44, begin a husband and a father, I knew that to be the role model I wanted and needed to be, something in my life had to change. I already had dissatisfied feelings about my weight, with changing clothing sizes on the rise. All of this together made me want to go all in and make a change. I began my transformation journey in April 2013. Through some wise advice, I was able to partner with HitchFit Rachel Godwin to begin my transformation. My first experience was an eye opener. To a guy who ‘felt’ he could handle a work out, heck 7 years of active duty in the Army, Rachel proved during my first work out that I had a long road to go! Humbling, of course, and yes humorous as Rachel had to make me a protein shake so I could gather myself to make it home. And the lesson that day, make sure I ate the right food before a workout! I was very meticulous with the eating plan and workout requirements. I knew that this was maybe the last opportunity for me to truly change my life. The great thing about HitchFit is that it is not a fad, eat like this for 3 months, lose weight, and then wonder what to do next. I understood this was a long term change, to live a healthier life, not just for me, but for my whole family. To which my wife joined the HitchFit program a month after me. Having my wife Sarah on this journey with me was amazing. It was daily accountability on working out, but really on the eating. We learned about all of the right brands of food to buy, and that the farmers market was a great resource for our fresh veggies. Sarah was great in coordinating our food preparations on the weekend, and helping me have food to travel with throughout my work day. It was hours of cooking chicken and all of the sides, putting that food scale to use and having every meal planned in advance. I love her for that help, but also for taking the challenge herself, our lives are forever changed. During my transformation, seeing the measurement changes was always exciting and added motivation to beat my last pinching. I kept a spreadsheet of all of my biweekly measurements, but also all of my workouts so that I was able to track my weight sessions, but also my cardio as it increased drastically over the last third of the program. It was just crazy to see my body change so quickly by merely working out and eating healthy. The only downfall was that I had to keep getting new clothes as nothing was fitting any more! And none of this would have been possible without the guidance of Rachel. I know that between emails, texts and questions during every visit, she constantly gave me wise advice, and pushed me to exceed my goals. I always loved my workouts, tough as they were, but so exhilarating. And even though I miss those today, I now confidently walk into the gym, really anywhere, knowing that I am one of the only 44 year old guys I know rocking a six pack!!! Or write to [email protected] for information on rates and how our programs work! 91st & Metcalf, Overland Park, KS.